Flummoxed by an intractable problem? You probably just need to work harder, right? Actually, try taking a walk instead. Thanks to how we’re hardwired, insight tends to strike suddenly—after we’ve stopped looking. 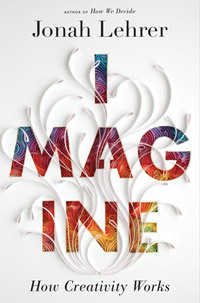 In this entertaining Gladwellesque plunge into the science of creativity, Jonah Lehrer mingles with a wide cast of characters—inventors, educators, scientists, a Pixar cofounder, an autistic surfing savant—to deconstruct how we accomplish our great feats of imagination. Notable themes emerge: Failure is necessary. The more people you casually rub shoulders with—on and off the job—the more good ideas you’ll have. And societies that unduly restrict citizens’ ability to borrow from the ideas of others—see our broken patent system—do so at their peril.